Nota bene: this page contains some spoilers for Michael Crighton’s novel and movie, but it does not reveal any out-comes or the end. I first read this novel several years ago and found it passionant especially since it takes place in France, on the Dordogne River in the region of Aquitaine. I spent 5 months in Bordeaux, the largest city of that region and 2 months in Limoges just to the northeast when I was 19 (1974) and saw and lived among some spectacularly pittoresque landscape just outside the city with trips down the Gironde River to Pauillac, up the river to Castres, site of an ancient Roman army camp (as its name implies), the moat-surrounded Château de la Brède, home of the very important philosopher, Montesquieu, who gave the concept of separation of powers to Madison for the Constitution of the United States. The purpose of this page is to gather facts in one place in preparation for the movie of the same name to come out making this a reference site useful to both book and movie enthusiasts. As such, it is subject to continual and perhaps massive change as I dream up things to put here and get corrections from other people. So far, the first movie trailer, which was challenging to locate on the web, reveals that a new character, the son of Professor Edward Johnston, has been created that does not take the place of André Marek, Chris Hughes, Katherine Erickson (Kate), or David Stern. Note that the first trailer is rather badly done. I hope it does not betray a shabbily made film also. Michael Crichton’s films have usually been done quite well including Jurassic Park, et. al. and the The 13th Warrior. I did not see that undersea movie, Sphere, and I did not think Congo was nearly as good as the book but I had no complaints with the filming, so maybe with this one, Crichton will go down in my estimation. Dordogne is the name of the northernmost department of the ancient Acquitaine region of France. It is the romantic, fabled home of great swordsmen and poets as created in literature by Edmond Rostand (Cyrano de Bergerac) and Alexandre Dumas (The Three Musketeers). On the map below, the large, red rectangle indicates the entire bounds of the modern-day France setting of this novel while the small, black rectangle locates the medieval setting into which the adventurers are plunged in search of their professor. I am guessing that Castelgard and Monastery of Sainte-Mère, the scene of the novel’s medieval action, are ficticious names. However, Sarlat, in the map above, is not ficticious, but an interesting village in France. A short scene in Sarlat occurs in the book and some of this village’s history is explained. This region of France, the Dordogne, boasts almost as many ancient monuments and points of interest as Paris. Sarlat in particular is a village that hardly changed from medieval times until it was saved from indiscriminant modernization after World War II when a much of the rest of France began to modernize with a vengence. Originally a place of pilgrimage because of its monastery, Sarlat attracted a lot of travelers and then inhabitants whereupon its monastic order fled elsewhere for peace and quiet. The town continued as a market center in Dordogne but declined ultimately over the centuries to nothingness. With no wealth to rebuild, the old section of town ( http://www.sarlat.com/geographie/plan2.jpg) was abandoned or neglectednever updated with plumbing or electricity. In the post-war affluence, the city leaders planned to tear out the old town center to make way for modern housing, but Degaulle’s minister of Culture, André Malraux, found government funding to save and restore it as a monument. The plan of action in the medieval segment of the novel, corresponding roughly to the little black rectangle in the modern map above, is given by an illustration on page 162 of the novel which I reproduce here with few modifications. I have added an X roughly where I think the group “lands” when they regenerate from the “quantum foam,” part of the experience of time travel in the novel. 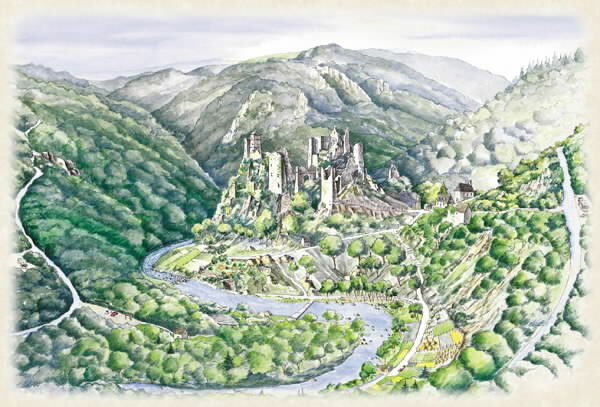 How about this as a suggestion for Castelgard as if painted from a tower of La Roque? This clearly shows a La Roque on the river in roughly the same area I had previously outlined as the scene of the novel’s action. I discovered this after I had decided where the scene was stumbling as I did upon this map. The blue bull’s eye marks Sarlat.